'Belle Tahoe' is a beautiful, custom 2600+ square foot home that combines all the comforts of home with the luxury of a fine hotel. With a spacious floor plan, four bedrooms, three full bathrooms and two common areas, there is plenty of room for you to spread out and enjoy yourselves. Relax on one of the two balconies, or just enjoy the forest views from every room. 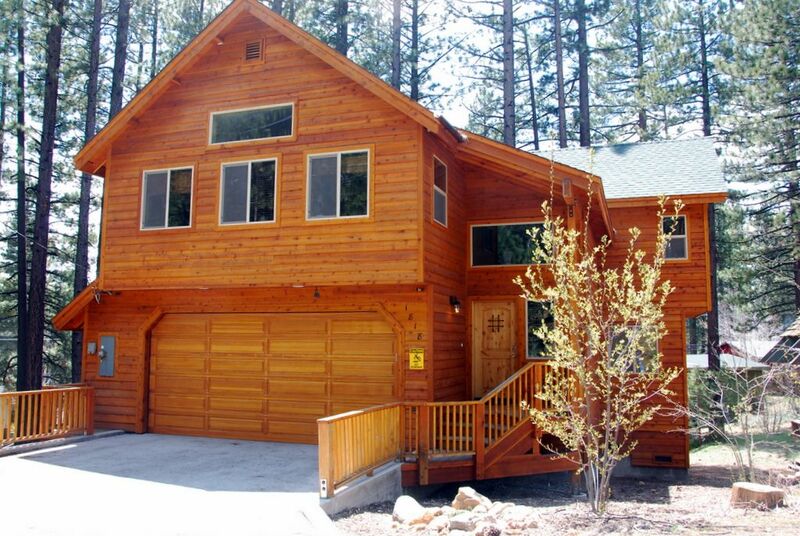 With no neighbors on two sides, Belle Tahoe really lets you get away from it all. Kitchen, Great Room & Den: The gourmet kitchen is every cook's dream: granite slab countertops, maple cabinets, 5-burner gas stove, double convection ovens, large refrigerator/freezer with ice maker, dishwasher, garbage disposal, microwave, toaster, coffee maker, espresso machine, blender, mixer, food processor, spices, oils, cutlery, pots & pans, and more! The adjoining dining nook seats 8-10 people at the table, with four additional stools at the kitchen island. In the Great Room, there's a magnificent floor to ceiling stone fireplace with large leather couches, 50' HDTV and home theater system. There's large wall to wall picture windows with views of the meadows and mountains. Take your meals, coffee or party outside to the deck with views of the woods, mountains and meadows. BBQ all summer long on the gas grill. Downstairs, there is a second common room with a 42' HDTV & DVD player, a queen size murphy bed, couch, games and toys. The sliding glass door opens to a second balcony. Bedrooms & Bathrooms: THE BEDROOMS: Rest easy...each of our beds has a high-quality pillow top mattress, luxury linens and fluffy pillows. There are two bedrooms upstairs (the master and a second), each with a King bed, cathedral ceiling, nightstands, dresser and walk-in closet. The two downstairs bedrooms have Queen beds (total of three), nightstands, dressers and walk-in closets. There is also a queen-size futon in the master bedroom and a queen-size murphy bed in the downstairs den. THE BATHROOMS: Go ahead - take a nice long bubble bath. With maple cabinetry, rainfall showerheads and granite throughout, you will be relaxing in luxury. The master bathroom features two sinks, a jetted tub and a walk-in double shower. The upstairs bathroom features two sinks, a soaking tub and a walk-in shower. The downstairs bathroom features one sink, a soaking tub and a walk-in shower. And, best of all, there are two hot water heaters, so the house is comfortable for larger groups. Parking, Laundry, Etc. : Our huge garage can easily accomodate two cars full-size SUV's, and two more cars may park on the driveway. The indoor laundry (downstairs) has a washer, dryer, and utility sink. For your convenience, we also provide a portacrib and high chair. We bought and started renting our house in 2009 and continue to have a great experience using it ourselves and renting it to visitors. We use the house ourselves about once per month, which allows us to stay on top of routine maintenance and keep everything in top condition for your stay. Booking: Reservations are only confirmed and dates held once the 1st payment and signed rental agreement are received. To receive a rental agreement , please send us the name as it should appear on the contract (must be same person who is paying) and their cell phone number. We also welcome reservations made using the 'Book It Now' request. We only rent through Homeaway, VRBO, or Airbnb, please contact us through those websites if you have any questions. Our names are Jeff and Jessica, and we've been coming to Lake Tahoe for several years with our three young children - twin boys and a little girl. We've visited at all times of the year, and we love going sledding and skiing, playing at the beach, hiking out our front door and trying the local restaurants. We wanted a house close enough to skiing, beaches, shopping, grocery stores and restaurants so that nothing was more than a quick drive away. We also wanted to have the seclusion to feel like we were getting away and not back in the suburbs. We found our dream house at the end of the street in a quiet, wooded neighborhood with mountain views. We love being able to walk out our front door and go hiking through the woods or exploring the meadow and Cold Creek. Dual zone heating. Double hot water heaters. Minimum age limit for renters. We were very pleased with Belle Tahoe. Just wish we could have stayed longer. Everything was perfect. We spent a weekend at Jeff & Jessica's home and we had a great experience. The house was the perfect size for our group. The kids enjoyed playing downstairs and adults chilled on the couch in the living room. The kitchen is really well stocked, beds were really comfy. Communication with the homeowners was very easy. We ended up staying an extra night and Jeff accommodated our last minute request. We will definitely be renting this house again in the future! Our family had a great time! This home is very comfortable and is close to all of the activities that we enjoyed. Thank you again for your hospitality! Stayed at this beautiful property around new years. The accommodations were very clean, warm and had all the mod-cons. I would highly recommend staying at this centrally located property (very close to Heavenly). This place was perfect for our whole family and our friends! For one night we had 12 people and everyone slept comfortably! The towels are amazing, Bathrooms beautifully remodeled, and the beds all comfortable and everything you could need in. Kitchen. Our favorite part was the large kitchen table we all sat at for family games and puzzles! perfect location to do and see everything on the Southshore! Owners were friendly, and very accommodating! Would stay here again with our family!